Why magento platform is best for eCommerce website development | Popular Platform for eCommerce Solutions. Magento ecommerce development platform is a revolutionary platform which has gained popularity due to its unique capability to deliver quick dynamic magento ecommerce solutions that is highly customizable. Magento was introduced in year 2008 and became the most preferable platform as it was easy to use for magento ecommerce developers and cost effective for end customers. Magento is an open source platform and hence a magento ecommerce development becomes very cheaper. Outsourcing Magento development in India can drastically cut the development cost involved. 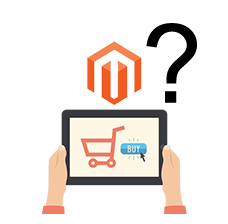 Magento e-commerce is the only platform that can create highly customized ecommerce website to suite any business type and requirements. Moreover a Magento website have cross browser compatibility. Magento e-commerce platform has multi-store facility. This allows you to create and manage multiple stores online through one admin panel. Magento Shopping cart can support multiple payment options that allow end clients to make payment in multiple currencies. Ecommerce website can developed in multiple languages to reach worldwide audience. Magento ecommerce development is SEO friendly because it facilitates SEO friendly coding, urls and site navigation. Magento web development allows integration of third party tools using web services, API as well as Google website optimizer for A/B testing. Magento Shopping Cart can be merged with other Content management systems platforms like Drupal, Joomla, Wordpress and many more. Magento ecommerce development always facilitates to integrate more than 50 payment gateways. Magento website can have one page manual and automatic checkout. Why Magento E-commerce Magento ecommerce development platform is a revolutionary platform which has gained popularity due to its unique capability to deliver quick dynamic magento ecommerce solutions that is highly customizable. Magento was introduced in year 2008 and became the most preferable platform as it was easy to use for magento ecommerce developers and cost effective for end customers. Magento Development is a company based in India, have huge experience in delivering wide range of high end magento ecommerce solution. We strongly suggest businesses to leverage Magento e-commerce platform as it can offer following benefits: Open Source Magento is an open source platform and hence a magento ecommerce development becomes very cheaper. Outsourcing Magento development in India can drastically cut the development cost involved. Easy Customization Magento e-commerce is the only platform that can create highly customized ecommerce website to suite any business type and requirements. Moreover a Magento website have cross browser compatibility. Create & Manage Multiple Stores Magento e-commerce platform has multi-store facility. This allows you to create and manage multiple stores online through one admin panel. Multi-currency & Multi-language Magento Shopping cart can support multiple payment options that allow end clients to make payment in multiple currencies. Ecommerce website can developed in multiple languages to reach worldwide audience. SEO Friendly Websites Magento ecommerce development is SEO friendly because it facilitates SEO friendly coding, urls and site navigation. Third Party Tools Magento web development allows integration of third party tools using web services, API as well as Google website optimizer for A/B testing. Integrate Open Source CMS Magento Shopping Cart can be merged with other Content management systems platforms like Drupal, Joomla, Wordpress and many more. Payment Gateway Magento ecommerce development always facilitates to integrate more than 50 payment gateways. Magento website can have one page manual and automatic checkout. Robust Reporting Magento website manages detailed report of customer transactions and performs easy order management. Magento e-commerce platform is the most robust platform to develop feature rich ecommerce websites. Our magento ecommerce developers have worked on diverse magento ecommerce development projects. Magento e-commerce platform also offers different editions to select from in order to meet the unique business requirements in most cost effective way. Loaded with dynamic features Magento Enterprise offers exceptional flexibility and control over the looks, content and functionalities of the online store. Generally this addition is suitable for establish or enhance a large dynamic ecommerce portal. The professional edition offers more features like customer store credit, reward point, strong data encryption, etc. that are not found in the basic open source community edition. This edition is available as open source for free. It requires highly experienced magento ecommerce developers to use this edition as it requires careful magento programming to develop a high end ecommerce website. Get free Quote!! we can discuss project for Magento Ecommerce Development services at Axis Technolabs.